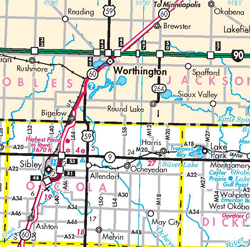 The Iowa Department of Transportation (DOT) requested a road safety audit (RSA) of the US 59/IA 9 intersection in northwestern Iowa, just south of the Minnesota border, to assess intersection environmental issues and crash history and recommend appropriate mitigation to address the identified safety issues at the intersection. Although the number of crashes at the location has not been significantly higher than the statewide average for similar intersections, the severity of these crashes has been of concern. This RSA was unique in that it included intersection video observation and recorded traffic conflict data analysis, along with the daylight and nighttime field reviews. This report outlines the findings and recommendations of the RSA team for addressing the safety concerns at this intersection.